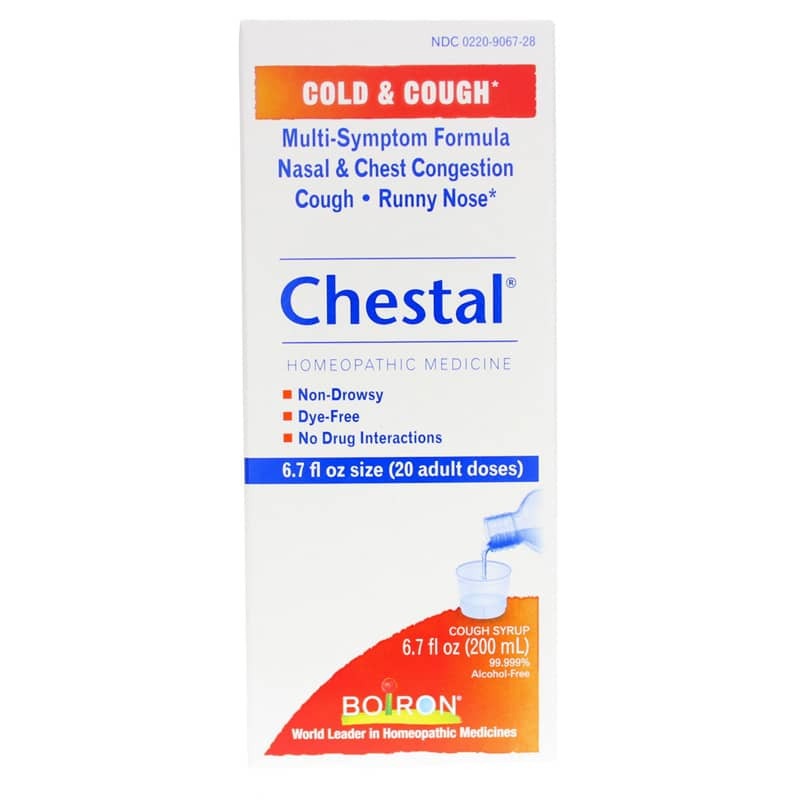 For multiple symptoms, get multiple levels of natural support with Chestal Cold & Cough Syrup from Boiron. 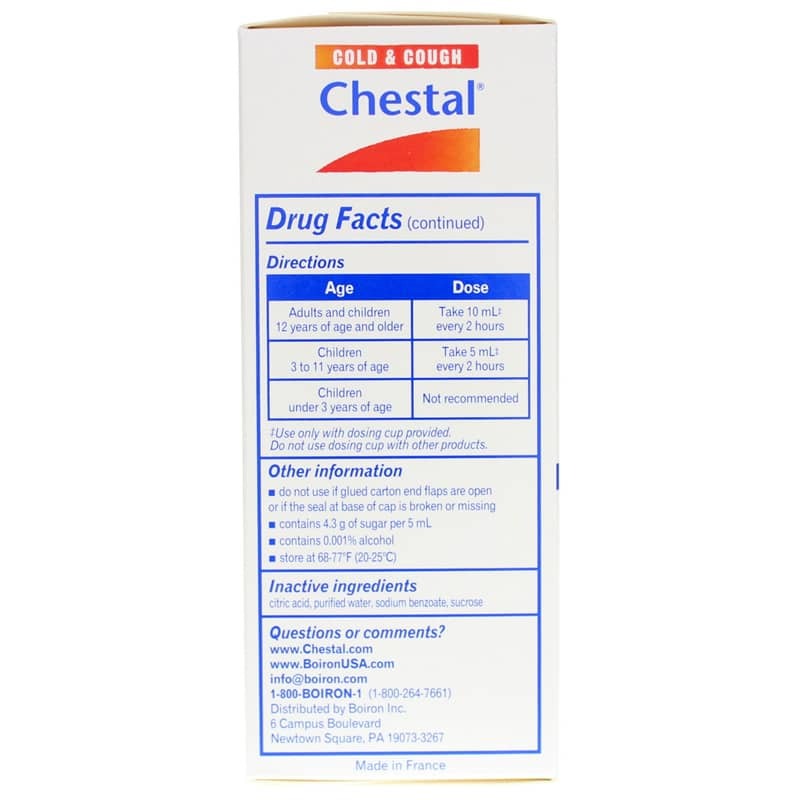 Chestal Cold & Cough is a homeopathic, non-drowsy syrup to provide support for relief of occasional nasal and chest congestion, cough, sneezing, minor sore throat and runny nose. This gentle homeopathic formula is designed to work with the body by triggering your body's own internal response. Its highly diluted plant, animal and mineral ingredients are specially selected to address a variety of symptoms, and are officially included in the Homeopathic Pharmacopoeia of the United States. For purity and gentleness, this syrup is free of dyes and artificial flavors, and is non-drowsy and has no drug interactions. Get homeopathic support for all of your symptoms. Order Chestal Cold & Cough Syrup. 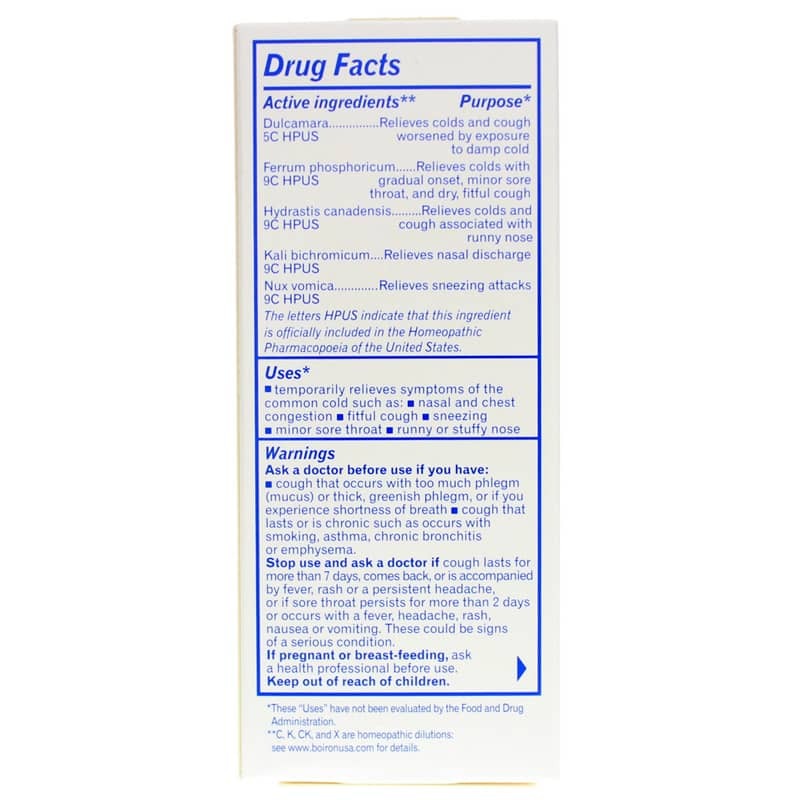 Inactive Ingredients: citric acid, purified water, sodium benzoate, sucrose. Contains 4.3 g of sugar per 5 mL. Contains 0.001% alcohol. Children 3 to 11 years of age: Take 5mL every 2 hours. Ask a doctor before use if you have cough that occurs with too much phlegm (mucus) or thick, greenish phlegm, or if you experience shortness of breath; or cough that lasts or is chronic such as occurs with smoking, asthma, chronic bronchitis or emphysema. Stop use and ask a doctor if cough lasts for more than 7 days, comes back, or is accompanied by fever, rash or a persistent headache, or if sore throat persists for more than 2 days or occurs with a fever, headache, rash, nausea or vomiting. These could be signs of a serious condition. Keep out of reach of children.